KAPCHORWA -19 people died on spot and several others sustained serious injuries after a minibus rolled downhill in Kapchorwa District on Tuesday evening. The vehicle, Registration number UG 222E belonging to Kiryandongo Technical Institute, was carrying staff members of National League of USA, an NGO, who were heading to a tour of Sipi falls when the driver lost control, forcing it to roll several times on Towei Hill on the Mbale-Kapchorwa road. Sipi region police spokesperson Rogers Taitika attributed the accident to brake failure. Taitaka said the driver lost control of the vehicle after he failed to break on the sharp corner of the road. “The bus was carrying 25 staff. 19 have been confirmed dead but we are still checking,” he said. “The injured have been rushed to different hospitals including Kapchorwa hospital. They had come to visit and tour Sipi falls before they head back to their respective districts after a workshop in Mbale town,” he said. The accident is one of the many that have claimed lives this year, with the biggest in Kiryandongo in May when 22 people perished. 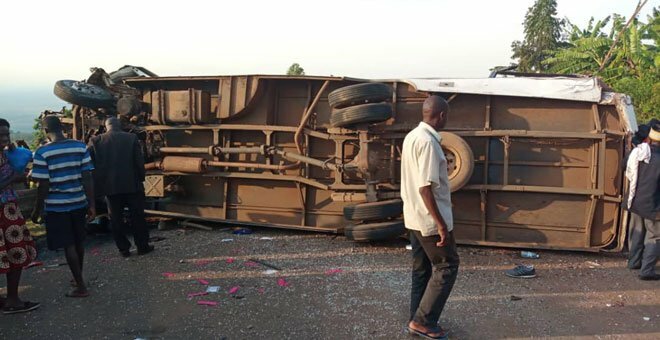 A Gaaga Bus that was travelling from Lira District to Kampala hit the tractor before it rolled and collided with an oncoming cargo lorry transporting crates of beer. This was at Nanda village in Kiryandongo District.